After a trip to a local do-it-yourself centre to get some new U-bolts, the antenna is finally up again. I tried to be careful in adjusting the lengths of the tuneable elements to be as accurate as possible but, apperantly, I did not succeed very well. You can see in my previous post that I went for a center frequency at 3.60 MHz and, as you can see on the graph, I hit it very well. Also, the SWR is below 1.5 for almost 100 kHz, which is twice as good as I expected. 40 meters, on the other hand, was not too impressive: I got SWR 1.1 @ 7.200 MHz and SWR 1.5 between 7.000 – 7.030 MHz. On 20 meter it is quite good, SWR below 1.3 all the way below 14.100 MHz, while on 15 meters better than 1.1 between 21.000 – 21.300 MHz. 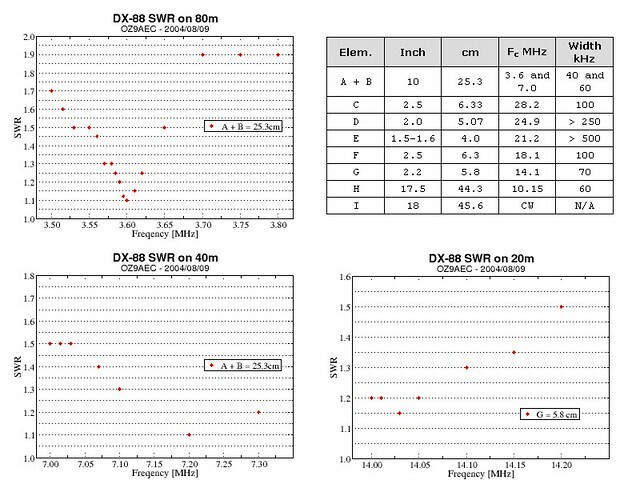 On 10 meters the SWR was better than 1.2 in the whole 28 – 29 MHz. Can we use a Raspberry Pi model B as FreeDV modem?